An excellent print on paper. Tape at top back, but well out of framing area. Overall excellent condition. ABOUT THE ARTIST: Favorite subjects Waalko John Dingemans (1873-1925), A favorite subject of the artist was the horse, especially workhorse. 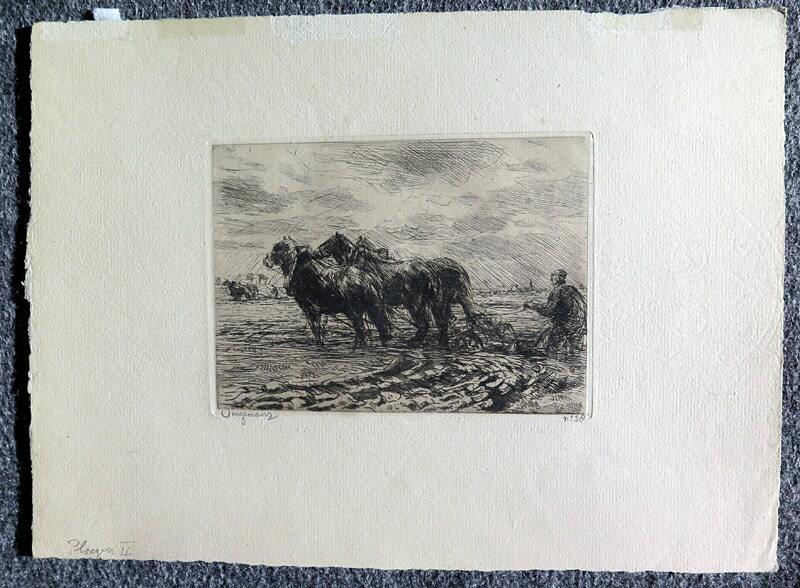 If he was in a city, Dingemans went looking for dray horses, skinny and tired, and in the countryside, he looked at the farmer's horses, big and proud. These scenes he recorded as an impressionist, fast, colorful and touch. He was with his life than a reasonably successful artist, whose work was sold by reputable art dealers as Oldenzeel in Rotterdam, Leiden and JH Sala de Bois in The Hague. Lifespan Because the artist's life, particularly a century ago, was a precarious existence, followed the young Dingemans from 1892, in addition to a full-time education at the Academy of Fine Arts 'Minerva' in Groningen, in the evening classes for the IRS. He completed both courses at the same time and more than twenty years he would combine his work as a painter with a job as a tax collector. The first years lived Dingemans in The Hague, where he became a member of the Hague Art Circle, for after a few years to move to Amsterdam, where he joined 'Arti et Amicitiae'en' St. Luke's. In 1911 Dingemans was appointed receiver rich in Gorinchem, where he was also a member of the city council, but here he remained active as a painter. He exhibited regularly, including with his good friend Simon Maris, and in that time appeared several positive reviews. Dr. PH Ritter jr. Called him said "an unusually strong drawing skills," the critic JH de Bois "an accomplished and skilled painter" and in an article in the monthly writing his work was typified 'Know' 'very, very pretty full of warm light, full of brilliant summer sun. " 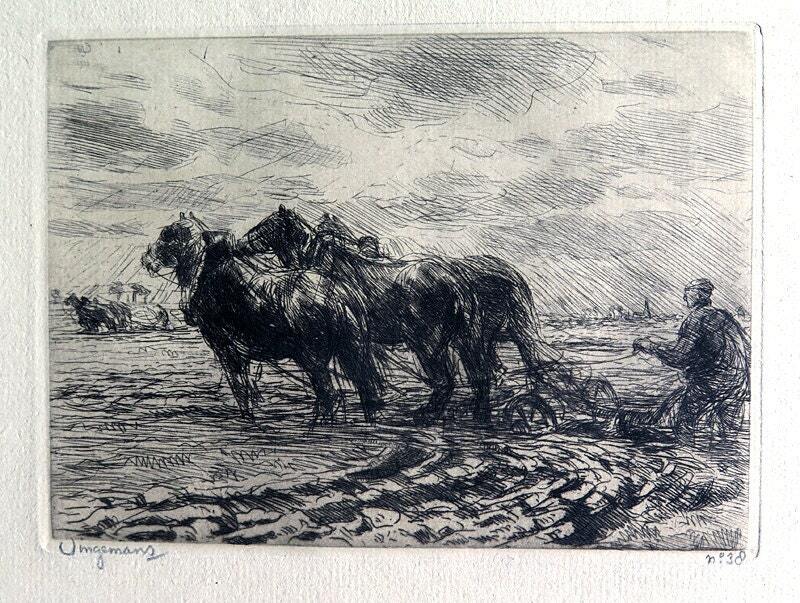 Zeeland But the busy work demanded eventually take their toll and in 1917 Dingemans was rejected for health reasons. From that moment he devoted himself entirely to his art. In these years he painted many in Zeeland. He possessed in Westenschouwen a house, where he often stayed for a long time with his family. Together with his wife, the painter Henriette Dingemans-Numans, he went then to start painting outside. His friend, the painter and graphic artist J. Graadt van Roggen, has accompanied him several times here on this picturesque tours. But long Dingemans does not enjoy more of this freedom, because in 1925 he died, only 52 years old. One of his friends characterized him as "a child of light, with his clear bright eyes and fair shining soul." This character also characterizes his work. Sunny, bright and fair.